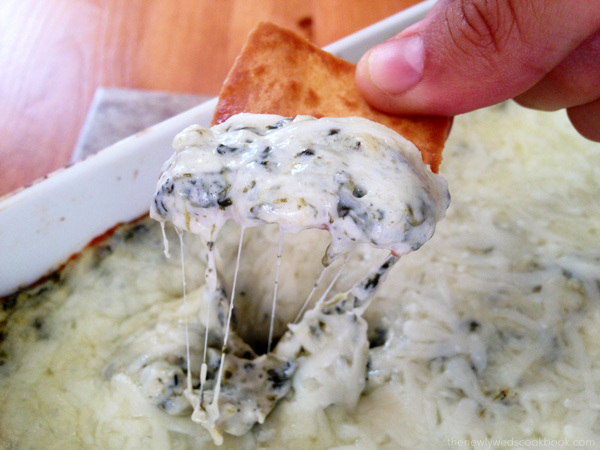 After having spinach and artichoke dip at one of my new favorite restaurants, Tavern in the Square, I knew I had to make it myself. The taste was incredible and the price was not so much, which is why I knew I had to make it for myself. While the dip was great, but like any restaurant appetizer, we were left feeling the portions were too small and we didn’t get our moneys worth. I knew I could do it myself and save lots of money in doing so. Oh, and make a much bigger portion of it for parties. 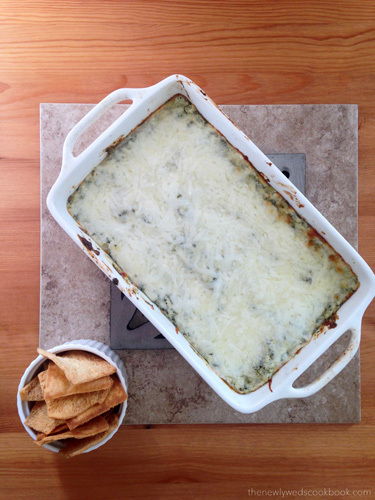 I always love having different dips and appetizers out when I have people over and I am so excited to share this one tonight! I followed this recipe, give it a try! The dip was smooth, creamy and the perfect amount of saltiness. Enjoy with some pita chips! 1. Pre-heat oven to 350 degrees and grease a small baking dish. 2. Finely chop the artichoke hearts, and set aside. 3. 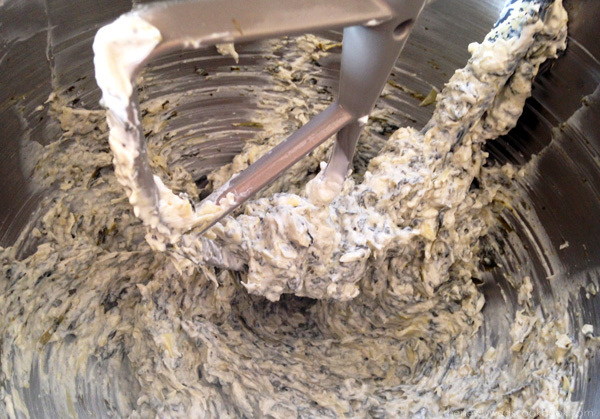 In a KitchenAid, mix together the cream cheese and sour cream. 4. 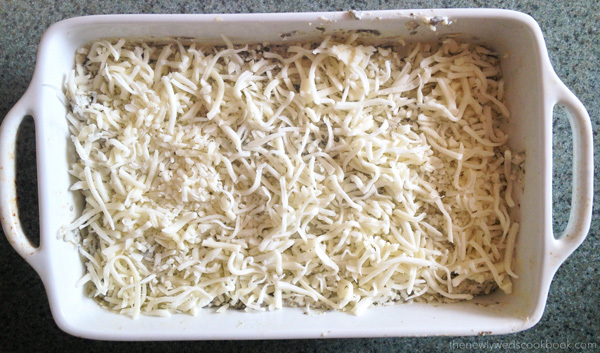 Now add 1/2 cup mozzarella cheese, grated parmesan cheese, garlic, salt and pepper to the KitchenAid, and mix well. 5. Now add the spinach and mix until completely combined. 6. 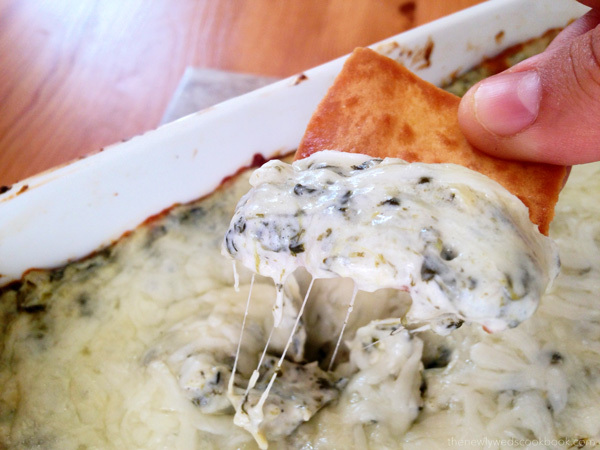 Pour the mixture into a small pan, and top with 1/2 cup of mozzarella cheese. 7. Stick in the oven for 15 minutes. You can add an extra minute or two on broil to get the top crispy, but we don’t have a broiler! *These pictures would look a heck of a lot better if we had a broil setting on our stove. But since it is so old, it doesn’t. Therefore, we couldn’t get that crisp top look that I would have liked. But if your stove has a broil setting (like most do) then you can make this look ten times better! !